Tribute Ale – the Official Beer of South West Rugby – is extending its support for the game beyond the region after signing a shirt sponsorship deal with London Cornish RFC. The flagship ale of Cornwall’s biggest brewer St Austell Brewery, Tribute is already title sponsor for grass roots rugby across the south west through the Tribute Leagues and also has shirt sponsorship deals with a number of clubs in Cornwall and Devon. 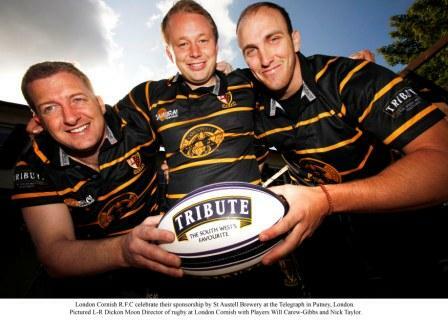 The deal with London Cornish demonstrates the brewery’s support for rugby and recognises the huge increase in national sales of Tribute, with London becoming an increasingly important and growing market for the ale. Players and staff from the club joined representatives from St Austell Brewery at London Cornish’s local pub, The Telegraph in Putney Heath, to celebrate the sponsorship deal which will see the first team taking to the field this season wearing smart new Tribute Ale branded shirts. London Cornish RFC is one of the fastest rising amateur clubs in London, currently playing in London 2 South-West. There are four adult sides playing in leagues every week and the club, based just outside Putney, frequently welcomes more than 50 players to their once a week training sessions.